What is Blastocyst Transfer? A blastocyst is an embryo that has developed in the laboratory for five to six days after egg collection and may have hundreds of cells following fertilisation. As the embryo advances in development, it forms an outer, thin layer of cells which will later become the placenta, and an inner cell mass which will develop into the fetus (baby). When an embryo reaches the blastocyst stage it is ready to hatch out of the zona (protective egg shell) and implant in the endometrium (womb lining). If the blastocyst continues to grow into the endometrium then pregnancy ensues. If an embryo reaches the blastocyst stage we can be more confident of its ability to form a viable pregnancy. For this reason, blastocyst transfer is used as a tool to maintain good pregnancy rates for patients who have a very good prognosis and have been advised to have eSET (Elective Single Embryo Transfer). The embryo transfer is usually very straightforward. It feels similar to a cervical smear test and should not cause too much discomfort. In most cases you are asked to drink plenty of fluids during the hour prior to your embryo transfer to ensure a full bladder. You will be advised prior to embryo transfer whether you will need to have a full, half full or empty bladder. At embryo transfer, a catheter (fine tube) is inserted through the cervical canal into the uterus and is used to deliver the embryos to the correct location. An empty ‘trial’ catheter is normally used to ensure that access is easy and in some cases abdominal ultrasound may also be used. Who can benefit Blastocyst transfer? Blastocyst transfer is recommended if you have produced good grade embryos in a previous IVF/ICSI cycle but no implantation occurred. The embryology team will discuss this option with you once your day 3 embryos have been reviewed. Are there risks associated with Blastocyst transfer? Data is rapidly gathering on outcomes of blastocyst transfer pregnancies. However, at this moment in time, the numbers of blastocyst transfers are still relatively small compared to the traditional two to three day transfers. There appears to be an increase in the incidence of identical twins with blastocyst transfer, but there has not been any obvious rise in any other risks associated with blastocyst transfer. Not all embryos will develop to produce blastocysts in the laboratory. 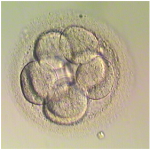 Embryos can stop developing at the four-cell stage (day two) and progress no further. 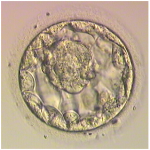 If your embryos stop developing or do not reach the blastocyst stage we may advise cancelling your ET. This is a difficult experience to go through, but does avoid you continuing to take medication for 2 weeks and the anxiety of waiting to perform a pregnancy test when there is very little chance of a positive result. The embryologist may advise your consultant that in your case it is safer to consider a day 2-3 embryo transfer than risk having no blastocyst to transfer on day 5 or 6. As with normal embryo transfer, due to the risks of multiple birth should more than one blastocyst is transferred, you may want to consider a single blastocyst transfer.